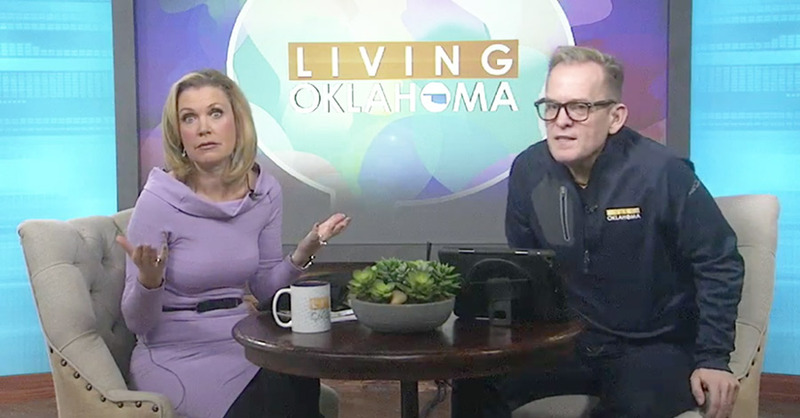 We have learned via the Ogle Mole Network that OKC media personality and news mommy, Meg Alexander, was let go as the host for the KOKH Morning Show “Living Oklahoma” this past Friday morning. If you remember correctly, Meg was placed on temporary leave back in February after she displayed some odd and slurry behavior on the set that she later attributed to a “lack of sleep.” Remember this segment about Valentine’s Day flowers? Following our article about the videos, Channel 25 quickly removed them from their website and placed Meg on temporary leave. The following Monday, they parted ways with Meg’s co-host, Mitch English, after he complained about the issue. He’s already landed on his feet in Florida. As I’ve written in the past, Meg has always had a kind of loopy, lost-in-space style and demeanor. I think it’s why people like her, but in today’s more woke times, it doesn’t really fly. Anyway, we wish Meg Alexander the best of luck finding a new job and landing on her feet. I expect to see her in a car dealership or Louie’s commercial very soon. Seems to be a new woman on the Richardson Homes ads. Thats cuz there is. Coincidence? Probably not. The. Name. Ogle. Stands for standard. That’s what his Sons. Represent. and to have a reporter. Who isn’t on top of her game she shouldn’t be working on Television. Especially with the Ogle name Attached. to it. Someone get Lance West on the phone now. I think please is a little more into texting. wow, she doesn’t seem just flat out drunk, but impaired in some manner. She really seems to be affected by something. I hope she gets the help she needs for herself and her family. The loss of a Fox 25 job at her level is more painful to her ego than bank account, they pay 7-11 money except for the very top talent. Perhaps The Lost Ogle could hire her to write a few articles! Narcolepsy? Sleep Apnea? Hypoglycemia? Migraines? There are a lot of possibilities to investigate other than drugs or alcohol. Patrick, the real question is, are you ready for that Father’s Nursing Assistant device yet? From someone that has drank quite a bit, seems drunk. I hope she gets it figured out. As a young person, 20+ years ago, who worked at a snotty Country Club full of trust fund babies looking down their nose at me, Meg was always a genuinely nice person. Man, that was painful to watch. LOL Was just on her Facebook page and apparently she never got the memo she’s been fired. Posted a pic on there saying she’s on vacation this week.